Boss Monster: Implements of Destruction is a small expansion set with a total of 29 new cards for the retro arcade style game. The new cards include five new Bosses and 24 new Items. This will be the first set to feature Items since the Tools of Hero-Kind expansion. Some of the Item cards will be Explorer Items for use with the Crash Landing expansion. 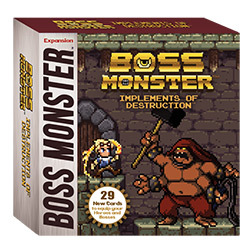 The expansion is compatible with both Boss Monster and Boss Monster 2, and requires one of these sets to play. Preorder Boss Monster: Implements of Destruction (BGM016) now!